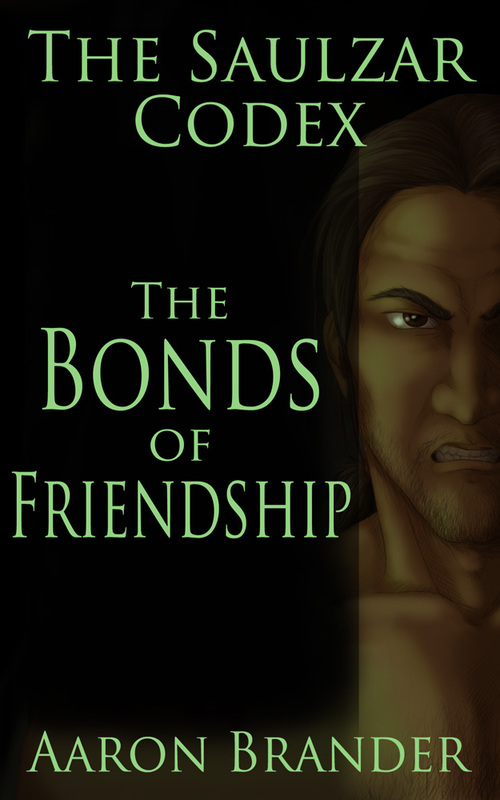 I’m happy to announce that The Bonds of Friendship is now available! It is the second part in the Saulzar Codex – a series of short stories focusing on Saulzar, a fierce warrior battling to overcome his own past. You can learn more about the project here. I’d love for you to stop by and pick it up. It’s a short story at 8500 words and is priced at $0.99. The next story, The Illusion of Control, will be ready to go by October 1st. The three men were already dead, they just did not know it. Hidden in brambles beside a dirt track, they were happily arguing about what they would find in the wagon after they attacked. “One-ear wouldn’t have us wait here overnight just so you can fill your belly. It’s gold, I tell you,” said the man on the left. He was going to die first. Saulzar lurked behind them, waiting and watching. His scimitar, Hunger, was unsheathed in his right hand, and its strange power pulsed through him, calling for blood. He held the sword’s desire in check, curious to know what these men were after. “Gold for sure. Gold offerings,” said the man on the left. “It better be ale and food,” said the third man. “Quiet, there it is,” the leader said. Along the road came a wagon, pulled by two oxen. Driving the wagon was a plump, bald man, dressed in a brown, flowing robe with a blue sash. Next to him sat a wisp of a woman, black hair pulled back, an easy smile on her face as she laughed with the bald priest. A memory pulled at Saulzar. A memory of love and laughter and joy, so foreign to the violence and savagery he had immersed himself in, that he stopped and his heart fluttered. The loss of her love was raw, even months later. He tore his gaze from the woman and focused on the men that would harm her. He would not lose her the way he lost Jafina. He leapt up from his hidden copse as the three men crashed onto the road. Driven by Hunger, Saulzar closed on the man, who hoped to find gold, and thrust the sword through his neck. Blood sprayed, mixing with the dirt and salt on Saulzar’s face. Hunger cried in exultation and Saulzar mirrored the cry, unable to contain the joy that surged from the sword into his soul. And he was the hunter. The other two men ran towards the wagon, oblivious to the danger behind them, all sound and fury and bluster. The priest of Herna pulled hard on the reins, and the wagon skewed to a stop. The woman screamed at him to keep going. The priest yelled and cursed at the brigands, but they did not slow. Saulzar pursued, the sickly sweet smell of blood in his nostrils and a bloodlust driving him on. He closed on the next man, who hoped for food, in three running strides. Hunger whipped out, ripping through the man’s spine just above his waist. He fell and the irony that he died from Hunger was not lost on Saulzar. stopped hard and parried a downward stroke from the lead rider, fighting for his life against odds he did not relish. But Hunger had no such concerns. Here was more blood to slake its thirst. The second rider was upon him, and all he could do was slip in under the strike and drive his pommel into the horse’s flank. The horse swerved, nearly tossing its rider, but Saulzar was not watching. He was focused on the final horse. It was a rangy roan, and its brown and white legs were a blur as it pounded towards him.